In 1993, at the Harvard Conference, Groden showed his slowed down, stabilized version of the film with the excised frames inserted. I'm a little rusty on the Z-film. (IOW my brain is getting rusty.) Who excised frames from the film, who found them and inserted them, and how if at all was the excision explained in the first place? If frames are known to have been excised (and then restored), I don't know how anyone can say that the Z-film wasn't altered. I think that Martin's review is flawed. I don't have time to pick it apart, because there is too much to pick apart. So I'd like to focus on one part of Martin's review. Then, like a house of cards and a breeze, it all falls flat on its face. That package. It's not too hard to tear apart any argument about its perceived size, or what it contained. In hindsight, of course, we all like to pay special attention to that package. At the time though it probably wasn't considered important by anyone that noticed it. * Lee didn't need curtain rods. * No curtain rods were found anywhere in the TSBD in the wake of the assassination. * Why on earth would Lee make a special journey to get some curtain rods that he didn't really need? If he did need them (which he didn't) why didn't he just get them during his usual weekend visit? So we know that the package didn't contain curtain rods, but we know it existed and that it contained something. So what was in that bag if it wasn't Lee's rifle? One thing you can't accuse the the authors of is failing to apply basic common sense. Package argument destroyed. My, that was quite easy! You're being way too kind to call Hay's review "flawed." I just read through some of his writings and they are absurd. He writes well, but his facts are screwed up, and he's guilty of terrible cherry picking--which he loves to accuse others of. 2. Hay says no one saw Oswald with "the" rifle or "a" rifle (which is not clear) for two months perior to the assassination. Has he (conveniently) forgotten about those who saw Oswald engaged in rifle practice, the week before? What about Dr. Wood, and his son? They were deposed by Liebeler. Has Hay (convieniently) forgotten about that testimony? 3. Hay makes it appear that because Ruth Paine telephoned the TSBD, she "got him" the job. More nonsense. Hay clearly does not know the "back story" of that situation. Its not so simple, Martin. I think you need to study up on that situation. 4. He says that the call to Ruth Paine from Michael Paine was a collect call (huh?) and made on 11/22. Pardon me, but I remember seeing those FBI reports, and I think they are dated 11/23. (If I am wrong, I will gladly admit it. But for Hay to reference that to John Armstrong is very "iffy". And his whole rendition of the situation is akin to a novelist telling a story. Stanhope Gould--the senior producer at CBS (under Cronkite) who later worked at KRON-TV in San Francisco, and who (along with Sylvia Chase) did a TV recap of my work (1988) re-interviewing the key witnesses, said that I ("David Lifton") had "courtroom quality evidence that President Kennedy's body was intercepted between Dallas and Bethesda." But, our friend Martin Hay, who decries cherry picking, and tells us that WC attorney Willens was "in denial," engages in that very same behavior when it comes to the issue of autopsy fraud, and , in particular, autopsy fraud that began with the covert intercept of the body, and then the matter of bullet removal and wound alteration. How anyone can engage in this sort of behavior and remain credible is completely baffling. 6. Does Hay believe that Lyndon Johnson became president because Harold Willins (and others on the Warren Commission) endorsed the single bullet theory? Martin Hay ignores the critical evidence of conspiracy in the medical area; he makes false statements about the Paines; he asserts that Marina Oswald's testimony is "worthless" (what balderdash! ); he claims Oswald did not carry a package long enough to the TSBD (apparently blissfully unaware that, in her original FBI interview (on 11/22 at the DPD) Linnie Mae Randle told the interviewing FBI agents that the package she saw Oswald carry was 36" long, and about 6" wide). Get real, Martin. Then Hay has the gall to package his ill-informed beliefs as if he knows the truth, and everyone else is either mistaken or intellectually dishonest. (And, of course, he will be the judge, excusing himself, of course, when he indulges in such behavior). Does Hay understand that documents--and about 10 witnesses--establish that JFK's body arrived in a body bag at Bethesda, about 20 minutes before the Navy ambulance carrying the coffin? Or has that escaped his notice? Does Hay understand that serious minded lawyers for Macmillan checked and reviewed the evidence of intercept before accepting my manuscript for publication? And before running ads across the nation showing the AF-1 offload and proclaiming: "The coffin was empty?" Does Hay understand the screening process that goes into the selection of a book for "Book of the Month" selection? And which resulted in the selection of BEST EVIDENCE --from over ten of thousands of books, as a Book of the Month alternate in early 1981? Does Hay understand that my book was published by four separate publishers over a 17 year period (yes, there will be a fifth) and that there was not a single lawsuit? Instead of dealing with real data and the most important data of all--that resident in the President's body--Hay crawls into his shell, this cocoon that I call a "1967 view" of the JFK case, fourteen years before the publication of Best Evidence, and reports back from his time-capsule as if the truth wasn't found because of a political conspiracy on the staff of the Warren Commission. Oh yeah. . sure. . dream on, Martin Hay. The truth wasn't found in this case because of fraud in the evidence. Not all of the evidence, but a critical part of it. The truth wasn't found, in this case, because of the successful execution of a strategic deception on November 22, 1963, and in the days immediately following, which created the false appearance that Oswald's rifle was the murder weapon; and that Oswald was the assassin. The notion that Hay's kind of oversimplified, juvenile analysis--his oversimplified view of "political science"--circa, 11/22/63 ( Martin Hay style)-- is continually posted at CTKA, where--apparently--it receives the blessing of DiEugenio is most unfortunate. Does Martin Hay really want to solve the Kennedy assassination, or is he interested in an interminable debate? "Great lawyers have an instinct for the jugular; Martin Hay has an instinct for the capillaries." It's nice to hear from you, David. But I do think your outrage is misplaced. If one is to conclude that everyone doubting the body was altered en route to Bethesda is somehow unqualified to write about the assassination, as you have apparently concluded, then one will be forced to conclude that 80-90% of all negative reviews of Oswald-didi-it material have been written by people unqualified to write about the case. Well, if this is so, then you oughta get busy. Someone needs to confront these books, articles, and programs. Perhaps you think there is an army of CTs who fully embrace your theories willing to pick up the slack. But I spend too much of my time online, and have attended 6 conferences in the past three years, and can assure you no such army exists. Most CTs today hold some sort of personal hybrid theory...some shots from behind, some from the front. Many if not most of those thinking the body was altered believe it was done so at Bethesda, as opposed to en route. It seems clear then that while your theories were ground-breaking, and influential, that they haven't been fully embraced. But who knows? Things could always circle back. I think it strange, moreover, that you have opted to go after a review most of us have forgotten, of a book very few will ever read, and that you have chosen to go after Mr. Hay over some aspects of the case where his perspective is far more popular than your own. Now, you could always be correct on this. But you're not gonna win many converts to your cause by attacking Mr. Hay for his mistrust of Ruth Paine, when the vast majority of CTs similarly mistrust Ruth Paine. And then there's this: "Martin Hay ignores the critical evidence of conspiracy in the medical area; he makes false statements about the Paines; he asserts that Marina Oswald's testimony is "worthless" (what balderdash! ); he claims Oswald did not carry a package long enough to the TSBD (apparently blissfully unaware that, in her original FBI interview (on 11/22 at the DPD) Linnie Mae Randle told the interviewing FBI agents that the package she saw Oswald carry was 36" long, and about 6" wide). Get real, Martin." What? Martin is 100% correct on this issue and you are 100% wrong. Ms. Randle approximated that the bag was 3 feet long and then said it was much shorter once the FBI re-enacted the bag and showed her what a 3 foot long bag would look like. She also deferred to her brother, who got a much better look at the bag, and swore from day one and continues to swear that the bag shown him on the night of the shooting was not the bag he saw Oswald carrying early that morning, and that this bag was both way too big and made from a different kind of paper. And that's not all--what's with your claim Oswald practiced with his rifle? Martin Hay was correct. The FBI and WC looked into it and found no credible evidence Oswald had practiced with his rifle in the months before the shooting. A number of witnesses had popped up claiming he had done so, but they were all shot down for various reasons. Are you claiming the FBI and WC were wrong about this, and that they were overly-generous to Oswald in rejecting these "sightings"? You write: "What? Martin is 100% correct on this issue and you are 100% wrong. Ms. Randle approximated that the bag was 3 feet long and then said it was much shorter once the FBI re-enacted the bag and showed her what a 3 foot long bag would look like." Sorry, Pat Speer, but its you who are mistaken. Randle's original description, if true, makes clear that the package she saw was certainly big enough to contain a rifle. What happened next is that Buell Wesley Frazier did not want to be in the position of being accused of having transported Oswald (and his rifle) to the TSBD. So he (subsequently) claimed the package was smaller, and his sister then went along with that story. But let's take a closer look at this situation. There is a major difference between a 36" long package and a 27" long package. The increase in length--from 27" to 36" in 30%. Buell Frazier was scared to death that he was going to be accused of having knowingly transported Oswald--AND his rifle--to work, if his sister's longer description was the case. You write that she changed her story after the FBI "showed her what a 3 foot long bag would look like." Are you serious? Are you telling me that Randle did not know, from common everyday experience, "what a 3 foot long bag would look like"?? Are you implying that agents of the FBI had to "show" Linnie Mae Randle what a 3 foot long bag "would look like", in order for her to understand what she had originally described? Surely you do understand that this is not a subtle matter; this is not the difference between 1 and 3 centimeters. We're talking about a 30% difference between 27" and 36". Also, in your eagerness to embrace Martin Hay's "politically correct" argument, you omit the other dimension: it was not just the length (of 36"); Linnie Mae Randle added a dimension of width: "approximately 3 feet by six inches." And there's still more. Later that morning, Lee Oswald was observed on the elevator, going upstairs, and passed a witness (and her supervisor) and they both saw him carrying a long package. "What'cha got there?" he was asked. And Lee responded that it was a "fishing pole." Are you unaware of that evidence? Very likely you are. 1. Linnie Mae Randle told the FBI on Friday night that the package was "a long brown package approximately 3 feet by six inches". 2. Oswald told Frazier it was "curtain rods"
The Warren Commission legal staff--specifically, Joe Ball and David Belin--did not publish the original FBI account in which Randle described it as "3 feet by six inches." By doing so, they rendered that important FBI report invisible to the public until (as far as I know) I received it in a microfilmed order in 1969. I know that I discussed it --multiple times, and at length--with JFK researcher Todd Vaughan some 20 years ago. Further, Todd produced a memo showing that the Bookhout report was noted --within a day or so--at the Assistant Director level of the FBI. The Warren Commission legal staff did not do what any normal homicide investigation would do. THey did not confront Linnie Mae Randle (now deceased) with her original description. The Warren Commission legal staff did not call FBI agent Bookhout to testify and get him to give sworn testimony about his report. No doubt he would have stood by his report. (And that could have set the stage for a confrontation between Bookhout and Randle). Instead, the WC legal staff became complicit in a re-enactment which involved a "smaller" bag, and concealed the "problem: presented by Randle's original statement by shunting that report off to the archives and mentioning nothing about it in the Warren Report. jAnd you go along with all this? The witnesses who saw Oswald with the longer package (that he explained as a "fishing rods") did not make their statements to the FBI, but certainly did talk about it years later. It was first published in 1988 in American History Illustrated. I communicated with the author --Ed Oxford--and found his research and interviews, to be quite credible. (But that's a whole other story). And you, Pat Speer, now buying into this "group think" and this orthodoxy of political correctness rather than dealing with the original statements and what they clearly imply? And so now you tell me that "Martin [Hay] is 100% correct on this issue and you are 100% wrong". Oh pleez. . . Turning to the matter of rifle practice. . I have to ask if you have ever studied the original FBI investigation--and by that I mean Commission Document 5, 7, and the other early FBI Field reports (i.e., the Gemberling Reports). Each of them has a section dealing with "Alleged Rifle Practice." Obviously, not all of the reported incidents were Oswald, but to make the blanket statement that none of them were Oswald I find surprising. Are you unaware of the WC deposition of Dr. Wood, and his son? They were at a rifle range, and saw someone who appeared to be Oswald practicing. (Do you dismiss their accounts?) And what about the original media reports in which Oswald was identified as being at a rifle range. You dismiss all of that, too? In one of them, another person present, was identified by name as Frazier. (That was actually published in the newspaper). I do not have all of that material in front of me at this moment, but if you are taking the position that there is no case to be made that Oswald was ever at a rifle range, between the time he returned from Mexico City on October 3, and the day of the assassination, I think you are mistaken. Like a few here, I would appreciate a small digression in order to explain the missing Z frames. Also, you can watch the movie frame by frame on YouTube here and see the missing frames. Despite these missing and misplaced frames, I'm currently working on a web page and putting together some video clips where I hope to show, among other things, that the Z film has not been altered in any way. After watching it over and over, I just do not see anything that's been fudged, changed, or altered. All motion and movement in it is as smooth as it can be from a piece of film that was running through the camera at 18.3 frames per second. As a CT minimalist, I believe it'd be far easier to have a lawyer come up with a crazy idea like SBT and keep pushing it upon the public for 53 years - and have folks like McAdams, Von Pein, Myers, et al keep preaching their brand - rather than try to take a film, with each frame of it the size of a pinky nail, and alter it to fit the conclusion. I'm probably going to catch a lot of grief from this forum when my web page is ready, but that's OK. I'm confident in my beliefs to present the material for people to either support it or trash it. Later that morning [11/22/63], Lee Oswald was observed on the elevator, going upstairs, and passed a witness (and her supervisor) and they both saw him carrying a long package. "What'cha got there?" he was asked. And Lee responded that it was a "fishing pole." I've never heard that fairy tale before in my life. Who is the female witness, David? And who's the "supervisor"? I'd love it if that story could somehow be proven to be true, though, because such a "fishing pole" lie being uttered by Lee Harvey Oswald would be just that much more of a solid indication that the package he was carrying on November 22nd contained his Carcano rifle. Such a "fishing pole" tale, if true, would mean that Oswald told different lies to different people throughout the day on 11/22/63 -- with Lee telling Buell Wesley Frazier that the package contained "curtain rods", while (allegedly) telling someone else later in the day that the (presumably) very same package had a "fishing pole" in it. Why didn't Oswald just stick with the same story about curtain rods that he started the day with when he drove to work with Frazier? Because the more nonexistent things he tries to cram into that brown paper package, the more obvious (and provable) his lies become. But I doubt any such "fishing pole" or "fishing rods" encounter ever happened in the first place, much the same way Robert Groden's bombshell "I Was Giving LHO Change At The Time Of The Assassination When We Heard The Shots" witness, Mrs. Reid, was a hoax too, with that wholly unbelievable story being invented many years later. There were about four frames that Hoover said were missing because of a "printing error". These are about at the point where Kennedy disappears behind the sign. Groden got these frames from another copy of the film. So the one he showed at Harvard was the most complete version extant. When he showed it on an auditorium sized screen, it seemed to me to be obvious as to why there was a "printing error". When you see the entire sequence of Kennedy disappearing behind the sign, his body freezes, his hand stops waving, his head buckles forward. I believe Hoover deliberately got rid of those frames from his copy that he released for the WC. Kennedy was hit at about 190. Before he disappears behind the sign. The FBI and WC concealed this to make the interim between the shots shorter. BTW, do you know where the whole rigamarole about the Magic Bullet hitting at about 223-226 came from? You know, the BS that Meyersvision uses in his BS computer stimulation? But then, in 1975 they decided to try and do their own patch up job. So they got Itek, and their photo analysis shop, to do a single bullet theory bit at about 223-226. Yet CBS did not reveal that Itek had been saved from bankruptcy in the sixties when the CIA moved one of its own officers over to the CEO desk at the company! After that, the CIA doled out many contracts, along with the Pentagon, to the company, until it became almost a subsidiary. So that is where this whole thing comes from. What makes it worse is that the actual CIA analysis back in 1963 concluded there were multiple assassins! Anyway, this will all be in my two part essay entitled "Why and How CBS Covered up the JFK case". Which is largely based on the documents Roger Feinman got out of CBS during his termination proceedings in 1975 and 1976. Because he was raising a ruckus about all the violations of its own code of ethics CBS had made on both specials. 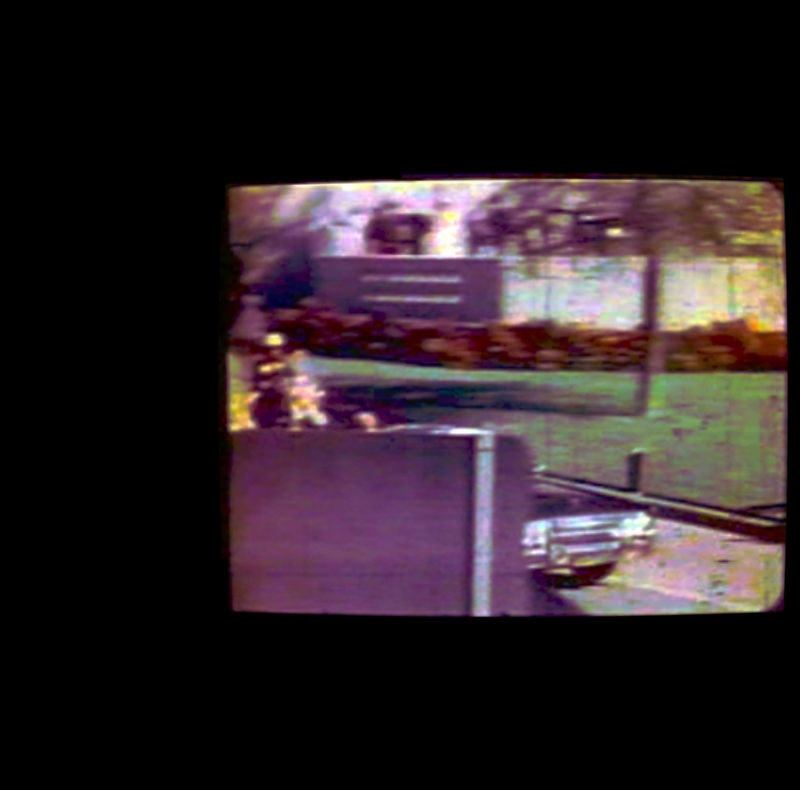 There were about four frames [of the Zapruder Film] that Hoover said were missing because of a "printing error". These are about at the point where Kennedy disappears behind the sign. Groden got these frames from another copy of the film. So the one he showed at Harvard was the most complete version extant. When he showed it on an auditorium sized screen, it seemed to me to be obvious as to why there was a "printing error". But, just like they do with all of the assassination evidence, conspiracists like Jim DiEugenio have to add in a nonexistent layer of "cover-up" when it comes to the topic of the "missing Z-Film frames". But that's what conspiracy theorists do best — they invent sinister activity where none exists. SOP for CTers. How is a guy dropping the film at Life and stepping on it a "printing error". This thread again exemplifies why the research community has become little more than a tiresome debating society. Martin Hay represents the most reasonable school of thought in very effectively critiquing David Von Pein's and Mel Ayton's predictably impossible Oswald-did-it book. David Lifton's curious, belated response relies on unwarranted faith in both Ruth Paine and Marina Oswald, the two witnesses who almost exclusively were responsible for painting a negative picture of Lee Harvey Oswald. David further maintains that Oswald DID carry a rifle into the TSBD that day. Is David now claiming Oswald fired shots? I thought his thesis was that all shots came from the front. What about Jack Dougherty, the only known witness to see Oswald arrive at work that day? He reported that Oswald was carrying no package. Oswald himself supposedly strongly denied carrying anything other than a lunch sack. David Lifton believes that JFK's body was altered before the autopsy at Bethesda, to falsely leave evidence of shots from behind, when all shots actually came from in front. Other than this rather "extreme" theory, he generally accepts all aspects of the official story. Pat Speer believes that all shots came from the rear, and that the medical personnel at Parkland who claimed to have seen a large hole in the back of JFK's head were mistaken (actually, I think he maintains that we have all been misinterpreting their testimony). He therefore believes the autopsy photos and x-rays showing no such large defect are legitimate. Jim DiEugenio comes closest to my own perspective, and in my opinion represents one of the few present-day critics who haven't rejected much of the ground-breaking work of the original band of critics, who decades ago conclusively proved there was a conspiracy. The research community is basically divided on John Armstrong's Harvey and Lee theory. Note- I am presently reading this book, and am even more impressed than ever with the extent of Armstrong's research. A growing number of researchers, largely associated with Greg Parker's ROKC forum, are putting all their eggs in Sean Murphy's "Prayer Man" basket. Needless to say, if "Prayer Man" is Oswald, his innocence is conclusively proven, but both sides acknowledge that higher-quality images are imperative if a conclusive identification is to be established. This same group just as strongly opposes not only Armstrong's theory, but the general notion that there were people impersonating Oswald. From my first few JFK assassination classes, I can conclude that more people are simply accepting the official narrative that Oswald acted alone. I can only guess this is due to the favorable publicity the mainstream media gave Posner, Bugliosi, Hanks' Parkland and now Stephen King's monstrous piece of disinformation. I think recent polls are demonstrating this. In other words, our task has become harder. It's tough fighting Stephen King and Hollywood. My point, again, is that we hardly represent any kind of united front on this subject. The official story is impossible. Impossible. That is with or without Harvey and Lee, or body alteration, or Zapruder film alteration, or Prayer Man, or any other aspect of this case that has been hotly debated on this forum. This is what I tried to stress in my book, and what I have stressed during interviews. Unless we recognize this simple truth, the lone nutters will eventually win the day. Their version is already in all the conventional history books. As we all know, history is written by the victors. It should be an undisputed fact at this point that those who assassinated John F. Kennedy were the victors. Mr. J. Edgar Hoover was clueless about many of the facts surrounding the JFK case—almost to the point of being laughable—as I talk about HERE. Don't confuse "ignorance" with "cover-up". OK. Liebeler says someone stepped on the film at Life. But he cannot get anyone to admit as to who did the stepping. Is that any reason not to include the missing frames in the volumes? And BTW, when you try and counter me with those frames on your site, you are showing them in stop motion, and in small size thumb nails. Which is contra my whole point: that Groden showed them in continuous slow and stabilized motion on a very large auditorium screen. Ever since Posner's book came out for the 30th, it has been just about a tsunami of disinformation by the MSM on the case. Mack cooperated on the cable TV programs e.g. ITTC, that used every trick in the book to take us back to 1964. Gus Russo and Myers worked on the PBS 1993 Frontline documentary on Oswald, and the Peter Jennings 2003 ABC special. That is the 30th and 40th anniversary. What happened at the 50th was one of the most bizarre, neurotic episodes in mass psychology that I can remember. I have never seen anything like that in my entire life. It should be made a study of the sociology and mass psychology of how a society denies its past. If anyone ever needed any more convincing about how this event has been deliberately covered up by the Power Elite, that was it. Especially what happened in Dallas, which was planned two years in advance by three centers of power: the Sixth Floor, the mayor's office, and Belo Corporation, owners of the local newspaper. That moment, with Dealey Plaza roped off at all entries by obstacles, backed up by 250 policemen working overtime, including police on horseback--that really reminded me of the best scene in the movie Cabaret,when one by one, the beer drinkers in the outdoor pub rise in unison singing the German anthem and then end up in a Nazi salute. The schizoid paradox is this: even though today, with the releases of the ARRB, the case for a plot against Kennedy has never been stronger, the resistance to that evidence today has become more forceful and complete than ever. If you look back at the 1967, 1975 CBS specials--which I did in preparation for my two part essay--at least they allowed some representation from the critic: they were allowed to appear long enough to make their points--before CBS "corrected" them. That is, people like Thompson, Wecht, Garrison got on. This does not happen anymore. Period. Mack and Russo took care of that. A good example would be what Russo did for the ABC special. Someone at ABC called Dave Wrone. They wanted his opinion on the Z film since he wrote a book about it. The ABC guy stated something that was false, and Wrone told him it was. He said he would be right back with the correct citation on it. So he left his chair to go to his den. When he got back the line was dead. The guy at the other end was too low on the food chain. But he was alerted to the agenda, however late. This is why I think that if we ever got the time to do a multi night special, with all this new information, it would be as shocking as when Geraldo showed the Z film in 1975. Because this censorship has made the great new info the far side of the moon as far as the public knows. Will we get that opportunity? Hmm. 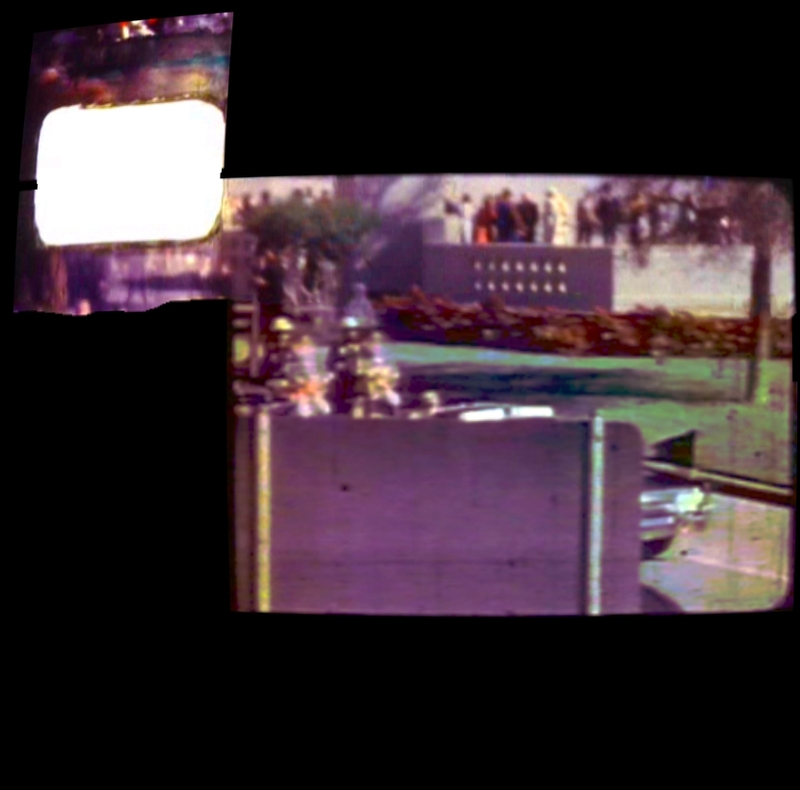 "Mr. DiEugenio makes a big deal out of the four "missing" (damaged) frames of the Zapruder Film, stating that years ago he had the opportunity to view a complete version of the Z-Film which contained those four missing frames (Z208-Z211), and as a result of that personal viewing (on a "really big screen"), DiEugenio is absolutely positive that President Kennedy was hit by a bullet at "around Z-Frame number 195 or so" [DiEugenio quote; 11/27/08], which comes close to matching the HSCA's erroneous timing for the SBT shot (which was Z190). And Jim's belief of an approx. 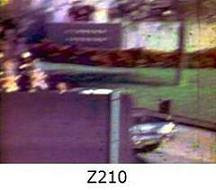 Z195 JFK hit is solidified in concrete by merely looking at "missing" frames Z208 through Z211 in motion on an unspliced version of the Zapruder Film. 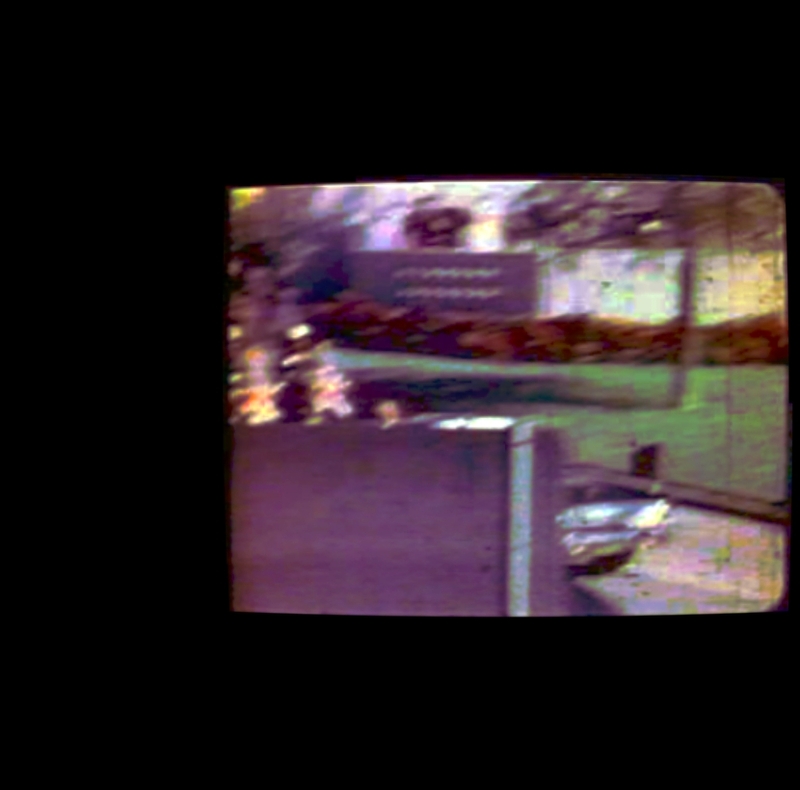 Jim thinks JFK's head "buckles" during these four missing Z-frames, which is proof to Jim D. that Kennedy was hit by a bullet just a few frames earlier. 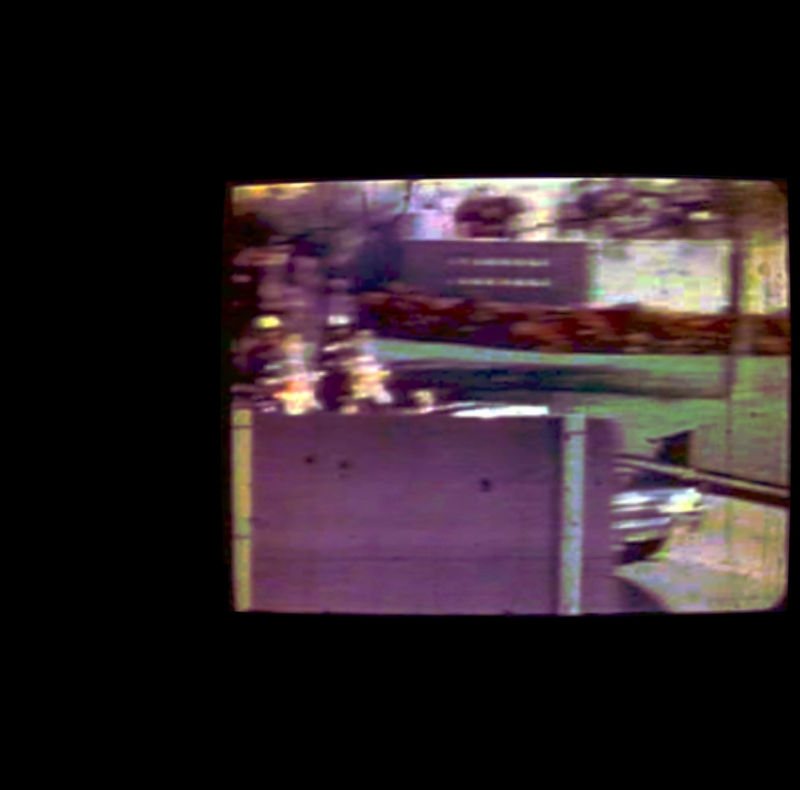 To think that the above 4 "missing" frames of the Zapruder Film prove that JFK was reacting to a gunshot wound is just incredibly far-fetched and speculative, IMO. 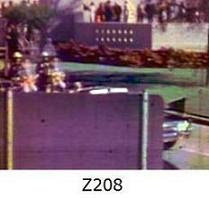 But, the little sliver of JFK's blurry head in Z208 through Z211 was apparently enough ironclad PROOF for Mr. DiEugenio to state as he did state on the November 27th BlackOp program -- "That's it" (i.e., that's all I need to see, folks; those four frames of the Z-Film, with Kennedy almost totally hidden by the street sign this whole time, are enough proof for me that JFK was hit by a bullet before he disappeared behind the signage). But then we have DiEugenio, just a few minutes later, telling the BlackOp audience (consisting of myself and one other guy in Helena, Montana, who was half asleep on the couch after consuming his heavy Thanksgiving feast) that JFK was absolutely, positively hit with a bullet at about Z195 (based on those critically-important 4 missing blurry Z-Frames that show JFK's "buckling" head). 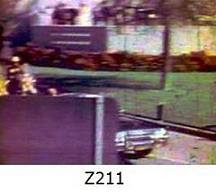 But what Jim doesn't tell his audience of two is that HE, too, must certainly believe in some type of a physical "delayed reaction" on the part of one of the two shooting victims (JFK in this instance), because we know that Kennedy doesn't start raising his arms up to his mouth and neck areas until Z-Frame 226, which is almost TWO SECONDS after Jim DiEugenio insists that JFK was struck by a bullet back at approximately Z195. So, Jim must believe that JFK's arm-raising reaction was, indeed, significantly "delayed". But when it comes to anyone else's theories about a delayed reaction on the part of the other victim in the limousine (Connally), Jim can't seem to control his laughter. Go figure the irony of that little two-faced argument there. But, as mentioned above, I suppose it's possible that Jim believes that Kennedy's arm-raising, which begins at Z226, is due to JFK being hit by a different bullet from the one that Jim says struck him at about Z195. I'm not sure what Jim's exact shot-by-shot theory is. But maybe he thinks Kennedy was hit at Z195, then again just before Z225, then again at Z313, and then again at Z898 as Bill Greer pulled into the Parkland emergency entrance (via the "real and unaltered" version of the Z-Film). 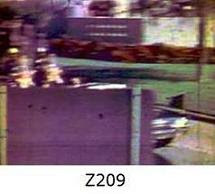 * = I, however, don't believe the "delayed reaction" theory myself, because I'm quite confident that both victims were hit by Lee Oswald's SBT bullet at precisely Z-Frame 224, with each man's reactions to this Z224 hit being perfectly "in sync" with one another and perfectly corresponding to the bullet striking each victim at exactly Z224, as demonstrated here." The official story is impossible. Impossible. The "Oswald Did It Alone" conclusion is not "impossible" at all. In fact, it's the only conclusion that the physical evidence supports.